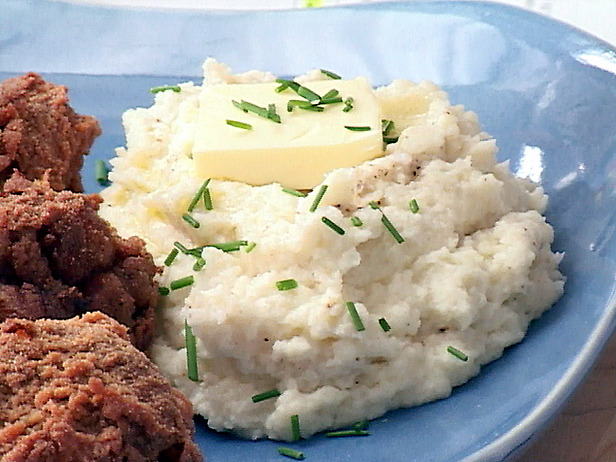 These are the best mashed potatoes every! That is really all that needs to be said! I made these to go along with the Chicken Fried steak and The Pioneer did not disappoint on these creamy mashed potatoes. I also had a head of cauliflower to use up so I boiled it with the potatoes and mashed it right in with them. A great way to hide another vegetable in a very yummy side dish. 1. Preheat oven to 350o F. Generously butter a 4 quart baking dish. 2. Peel and cut the potatoes into chunks. Bring a large pot of water to a simmer and add the potatoes. Bring to a boil and cook until fork tender, 20 to 25 minutes. 3. Drain the potatoes in a large colander. Place them back into the dry pot and put the pot on the stove. Mash the potatoes over low heat, allowing all the steam to escape before adding in all the other ingredients. 4. Turn off the heat and add 1 1/2 sticks butter, the cream cheese, heavy cream, seasoned salt, salt and pepper. Mash to combine. 5. Spread the potatoes in the prepared baking dish. Throw pats of the remaining butter over the top of the potatoes and bake until the butter is melted and the potatoes are warmed through, 20 to 30 minutes. 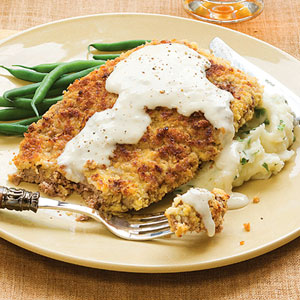 So last week for some weird reason I had a craving for chicken fried steak. Not a typical dinner at our house and I really wasn’t planning on making it for dinner. But then I sat down to catch up on some of my DVR and it must have been fate because while watching The Pioneer Woman on the Food Network she made Chicken Fried Steak. It looked so good that I knew I had to give it a try. It was super easy and full of flavor! I especially liked the seasoned breading that you also use to make the gravy. The whole family gobbled it up and it took care of my weird craving for the week. 1. Begin with setting up an assembly line of dishes. Mix the milk with the eggs in one; the flour mixed with the seasoned salt, 1 /12 tsp. black pepper, paprika and cayenne in another; and the meat in a third. Then have one clean plate at the end to receive the breaded meat. 2. Work with one piece of meat at a time. Sprinkle both sides with salt and black pepper, then place it in the flour mixture. Turn to coat. Place the meat into the milk/egg mixture, turning to coat. Finally, place it back in the flour and turn to coat (dry mixture/wet mixture/dry mixture). Place the breaded meat on the clean plate, then repeat with the remaining meat. 3. Heat the oil in a large skillet over medium heat. Add the butter. Drop in a few sprinkles of flour to make sure it’s sufficiently hot. When the butter sizzles immediately, you know it’s ready. Cook the meat, 3 pieces at a time, until the edges start to look golden brown, about 2 minutes each side. Remove the meat to a paper towel-lined plate and keep them warm by covering lightly with another plate or a sheet of foil. Repeat until all the meat is cooked. 4. After all the meat is fried, pour off the grease into a heatproof bowl. Without cleaning the skillet, return it to the stove over medium-low heat. Add 1/4 cup of the grease back to the skillet and allow it to heat up. 5. When the grease is hot, sprinkle the flour evenly over the grease (use the left over flour from breading the steak). Using a whisk, mix the flour with the grease, creating a golden-brown paste. Add more flour if it looks overly greasy, add a little more grease if it becomes too pasty/clumpy. Keep cooking until the roux reaches a deep golden brown color. 6. Pour in the milk; whisking constantly. Add the seasoned salt and black pepper to taste and cook, whisking, until the gravy is smooth and thick, 5 to 10 minutes. Be prepared to add more milk if it becomes overly thick. Be sure to taste to make sure gravy is sufficiently seasoned. We have a restaurant in our small town called Cracker Barrel. There menu is what I would call down home cooking or comfort food. Things like fried Okra and collard greens are on the menu. Our family loves their baby carrots and when I got a bag of carrots in our Bountiful Basket for 2 weeks in a row I was out to copy that recipe. The restaurant uses baby carrots but I just cut my carrots into bite sized pieces and they turned out great. It was a big hit at my house and got rid of a lot of carrots. 1. 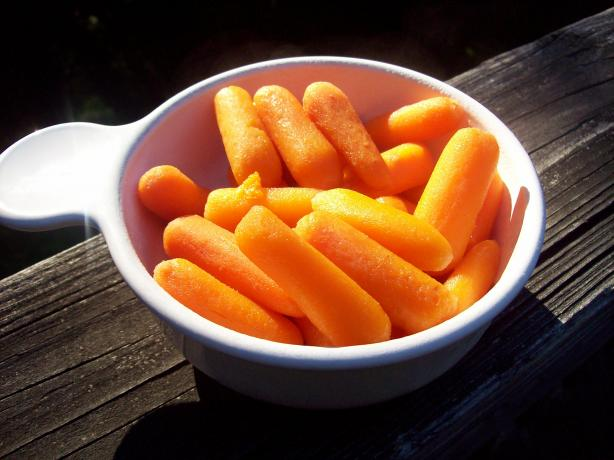 Rinse carrots and put in a sauce pan, pouring enough water n pan to just cover the top of the carrots. 2. Cover carrots and bring to a boil over medium heat. 3. Turn heat to low and simmer about 30 minutes until tender when pierced with a fork. 4. When carrots are tender pour off half to three fourths of the water. 5. Stir in the rest of the ingredients and adjust to taste. 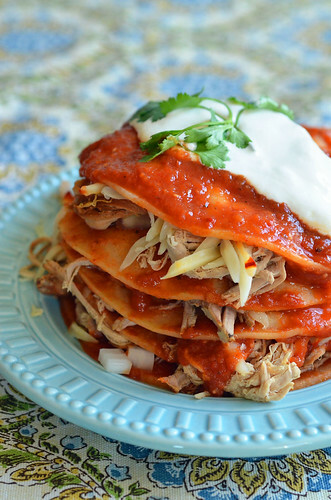 I am a big fan of Enchiladas but don’t always like all the work that goes into them. I loved this recipe because the pork cooked in the crock pot all day and you assemble these more like tostadas instead of enchiladas. Very flavorful and you can make these as hot as you like by adjusting the chipotle peppers. 1. Place the pork tenderloin and bay leaf in a large slow cooker. Pour the Dr. Pepper over the meat. Cover and cook on low until the pork shreds easily; about 6 to 8 hours. Discard the bay leaf. Transfer the pork to a cutting surface and shred the meat. Cover with foil to keep warm and set aside until ready to assemble the enchiladas. 2. Adjust your oven rack to the top of the oven. Arrange the roma tomatoes and tomatillos in a single layer on a baking sheet. Broil the tomatoes until softened, about 20 minutes, turning halfway through. They will shrivel and shrink. Remove any blackened skin and discard. 3. Place the roasted tomatoes and tomatillos in a food processor. Add the diced tomatoes, chipotle peppers with adobo sauce, tomato sauce, onion, garlic, flour, and water. Process until smooth. 4. Heat the olive oil in a large skillet until glossy. Pour the tomato puree into the skillet and stir. Season with salt, to taste. If the sauce is too thick, add a little water until desired consistency is reached, making sure to add more salt as needed. 5. In a large skillet, heat the canola oil until hot. Fry the tortillas until softened. Drain on paper towels. Dip on fried tortilla at a time in the pot of red sauce, turning to coat both sides. Place one each on individual serving plates, then layer each with shredded pork shredded cheese, and diced onions. Repeat layers until each serving is stacked two to three tortillas. I know I have been away from the weekly bountiful basket update for a few weeks. I have been enjoying my baskets but have been so busy. Thanks again to all the wonderful volunteers in Kingman, bountiful baskets would not be quite as wonderful without all of you! 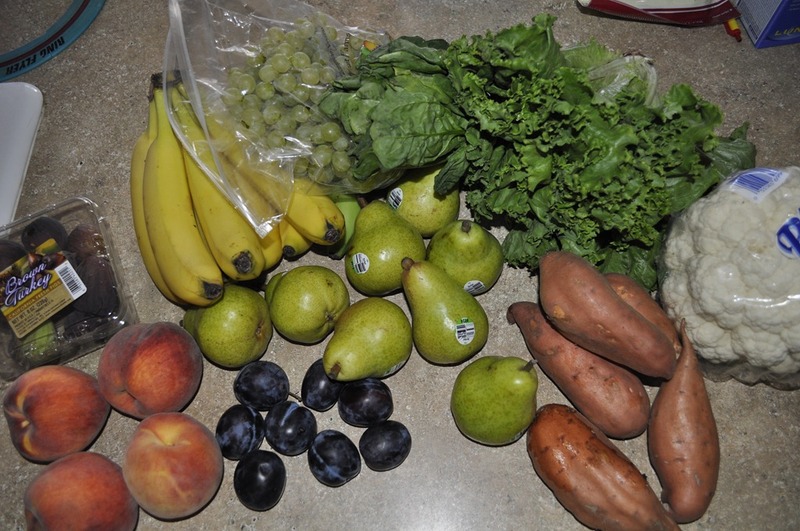 This weeks basket had figs, peaches, plums, bananas, pears, grapes, spinach, lettuce, sweet potato fries, and cauliflower. I was really excited to see sweet potatoes in our basket this week. I can’t wait to make sweet potato fries with them. If you aren’t up for that give the Sweet Potato and Paremsan Chips a try or Mashed Sweet Potato Casserole. Cauliflower with White Sauce is an easy side dish to make along with Oven Roasted Cauliflower. For something a bit different try Cauliflower Fritters. Last week I mashed our cauliflower in with our mashed potatoes for a great side dish. I am planning on making Mini Florentine Cups with my spinach from this week but another favorite in our house is Chicken Parmesan Bundles. If you are looking for something else try Lazy Baked Greek Chicken, Spinach Mushroom Cannelloni, or White Pizza with Spinach and Tomatoes. Whatever you make with your basket I am sure it will be great. Let me know what you plan on making with your basket and I will see you next week! This recipe can be made ahead of time and stuck in the refrigerator until you are ready to bake it. You can double the recipe to make more if you have a bigger family and it can also be made a frozen as well. So many options with this recipe. It is also really simple to make even on a busy night. 1. Preheat oven to 375o F.
2. Brown ground beef. Season with salt and pepper. 3. Add chopped onion, cook until tender. 4. 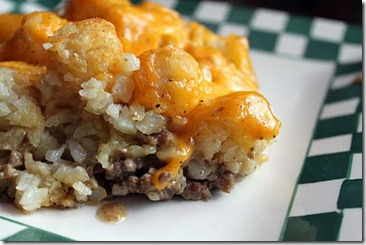 Combine ground beef mixture and cream soup and then spread evenly in a 9 x 9 casserole dish. 5. Top mixture with tater tots. 6. Bake, uncovered for 30-40 minutes until bubbly and tots are golden brown. 7. Remove from oven and top with cheese, return to oven until melted. 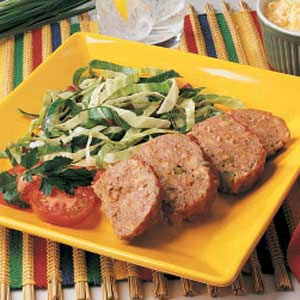 These mini meat loaves are super easy to pull together even on a busy night. What my family loves about them is that they are full of flavor and are small in size. I love that they are mini because that means each meatloaf has more of that crispy crust on it. The other thing about these is that you can omit or add so many different things into these and change up the flavor. Place meat in a bowl. Add egg, bread crumbs, Parmigiano, onions, garlic, tomato paste, salt and pepper. Mix meat and breading and form 4 individual oval meat loaves, 1-inch thick Coat loaves with extra-virgin olive oil and arrange on a baking sheet. Roast 18 to 20 minutes.